Ultrasound imaging is simple, repeatable, gives real-time feedback, and its dynamic soft tissue imaging may make it superior to other modalities for swallowing research. We tested this hypothesis and measured certain spatial and dynamic aspects of the swallowing to investigate its efficacy. Eleven healthy adults wearing a headset to stabilize the probe participated in the study. Both thickened and thin liquids were used, and liquid bolus volumes of 10 and 25 ml were administered to the subjects by using a cup. The tongue’s surface was traced as a spline superimposed on a fan-shaped measurement space for every image from the time at which the tongue blade started moving up toward the palate at the start of swallowing to the time when the entire tongue was in contact with the palate. To measure depression depth, the distance (in mm) was measured along each radial fan line from the location at which the tongue’s surface spline intersected the fan line to the point where the hard palate intersected the fan line at each timepoint. There were differences between individual participants in the imageability of the swallow, and so we defined quantitatively “measureable” and “unmeasurable” types. The most common type was measureable, in which we could find a clear bolus depression in the cupped tongue’s surface. Indeed, with 10 ml of thin liquids, we were able to find and measure the depression depth for all participants. The average maximum radial distance from the palate to the tongue’s surface was 20.9 mm (median) (IQR: 4.3 mm) for swallowing 10 ml of thin liquid compared to 24.6 mm (IQR: 3.3 mm) for 25 ml of thin liquid swallow (p < 0.001). 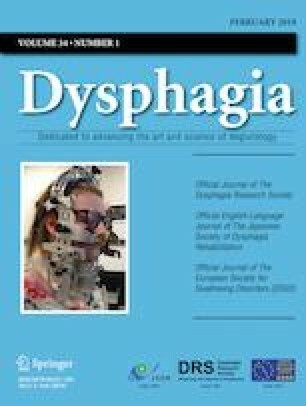 We conclude that it is possible to use ultrasound imaging of the tongue to capture spatial aspects of swallowing. We are grateful to the participants in this study. We were extremely fortunate to have the help of several individuals in the data collection. Special thanks to Prof. Alan Wrench for advice on instrumentation and Mr. Steve Cowen for his help in conducting the recording. Our thanks also go to members of Clinical Audiology, Speech and Language Research Centre, Queen Margaret University.